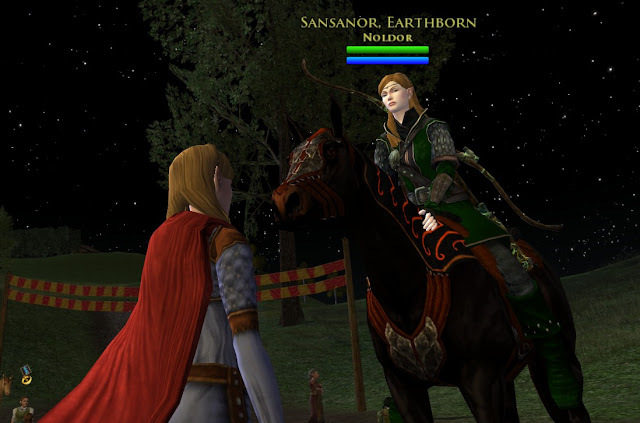 Someone asked me recently if I got the Steed of the Lore-Master. Well, of course. I actually think it is pretty. J He has a blue outfit that suits me well. He is a bit magical and has good balance to be able to hold those books and scrolls in place the way he does while riding through traffic in the Moors. With those scrolls just haphazardly tossed around, it looks a bit like my desk. Note to self… buy scroll-cases to pack that stuff down. Here we are taking our large festival haul back to the home of Angels. I ended up buying one of everything from the Faire, 6 steeds, an extra Chicken coop because I NEEDED it, and a dozen gifts for others. 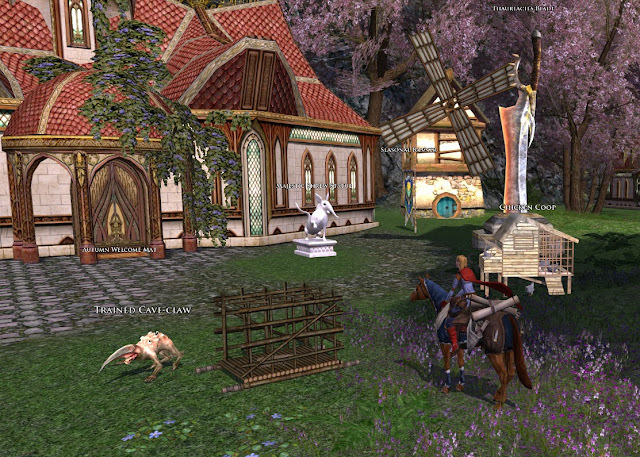 The Angel house is “busy” with animated things like the windmill, the Cave-claw, and the chickens. I should bring the Elf Female Property guard over. JThe only complaint I have is that I want more "hooks"... if I want my yard to look like festival threw up on it, that should be my prerogative. Easy access – There were conveniently located horses In MD and others to make travel to Bywater very friendly. Easy token gathering – Token gathering was very easy, but probably about right to attract casual attendees. Bounder rounds – Eventually this was fixed to where hobbits actually got drunk. It was completely broken on server the first 10 days. Likewise, Revenge of the Drunk was tied to Bounder rounds (otherwise it was fine). The change came very late for some who couldn’t get to Lorien to get help from the elves. Fishing: Fishy, very fishy – As far as I am aware, there was no one in Arkenstone that completed this quest. The fish that had to be caught were 10 Easy Fish, 10 Simple fish, 10 Possible fish, x Tricky fish, x Unlikely fish… without catching a Bad fish. I don’t know what the odds were, but the closest I ever came was to the Possible fish stage and caught two. With a 24 hour CD and odds that far to the extreme, this quest was a FAIL. If it were my world, I would (i) change the odds dramatically, (ii) change the CD to a much shorter time like 30 minutes, (iii) give a slight advantage to fishing skill to encourage people to actually fish more and have a goal, and (iv) reduce the number of fish to only need half as many. Egg Scramble – Mixed thoughts. It was possible to find the white eggs with many tickets; and with persistence, it was possible to obtain festival eggs in-game or trade. 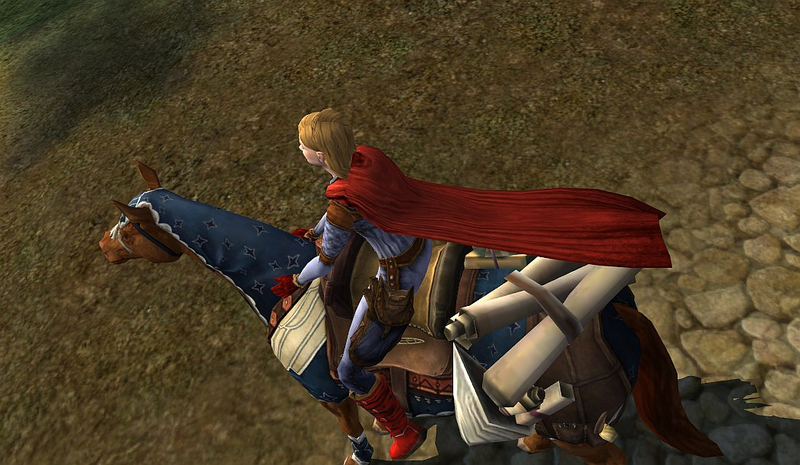 However, the final count of Golden eggs on Arkenstone was about 5 total for the Faire. That is stupidly bad odds, FAIL. If it were my world, I would (i) lock people out from getting more than 5 white eggs in a round so that others have the chance to win, (ii) change the odds dramatically here also, (iii) lock down how many festival eggs one player could get per round to improve win tally for all, (iv) drastically improve the Golden eggs odds and lock it to once per player, (v) fix the timer since the length of the rounds were oddly random, and (vi) remove the TicketGate. Ticket BOA – The Faire started with tickets unbound. Apparently, Store sales of tickets were not good (or it was unintentional to begin with), so they went to BOA. I don’t like the idea of the tickets at all, and going BOA was like a flip of the finger toward players. 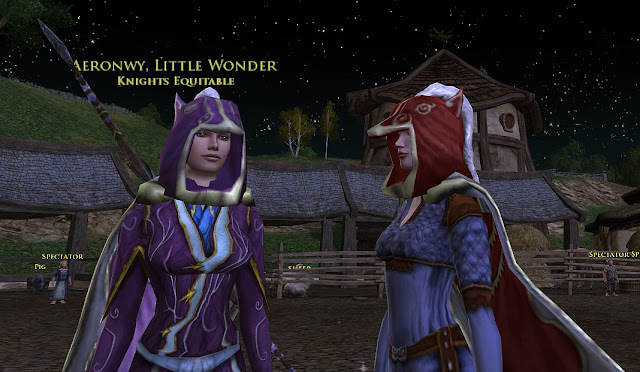 Though I ended with mixed feelings about the Faire, I still enjoyed playing with the people around me and enjoyed the quests that were working. Reader and new friend Aeronwy visits the Egg hunts and shows how to rock the Purple Steed outfit. Sis Sansanor rides in the dark hours toward the Faire on the Steed of Night, ready to see what festivities await. 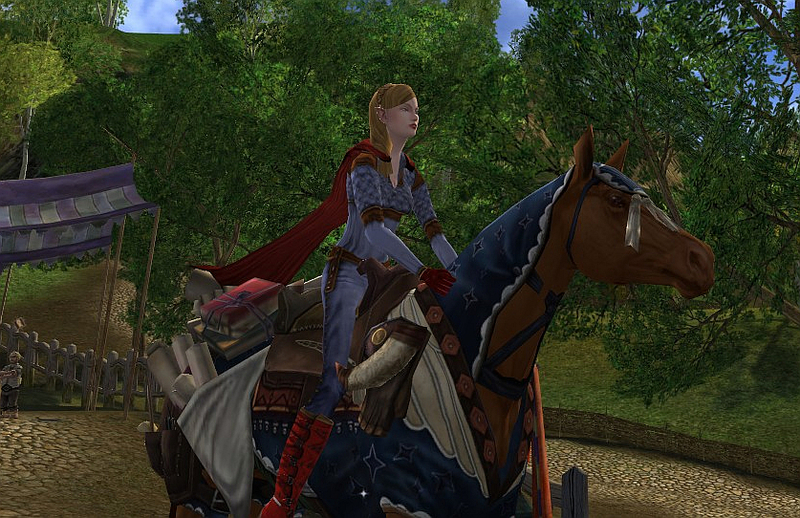 Danadelion, like all of the lildanas, got her Farmers Faire Steed. 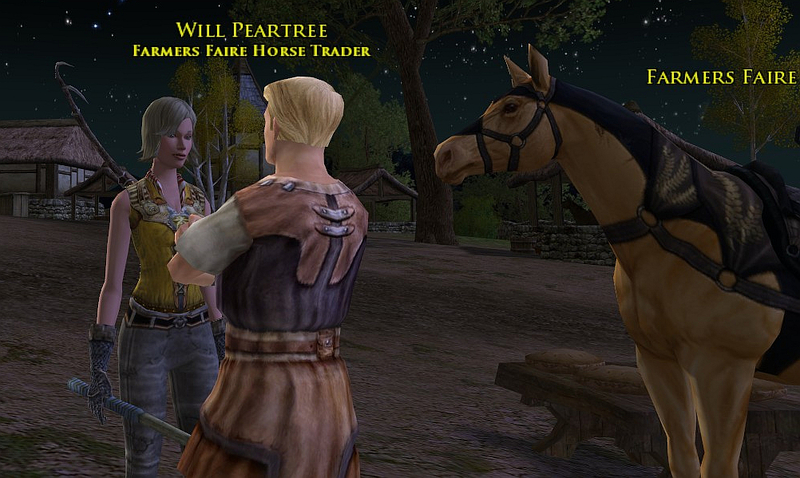 She hung around to have a nice chat with Will Peartree. Danadalyn really hit it off with Carl Proudfoot. It isn’t surprising as most hobbit boys like the wide-eyed minstrel Dalyn. For such little activity it actually has, Hengstacer is a popular place during festival. 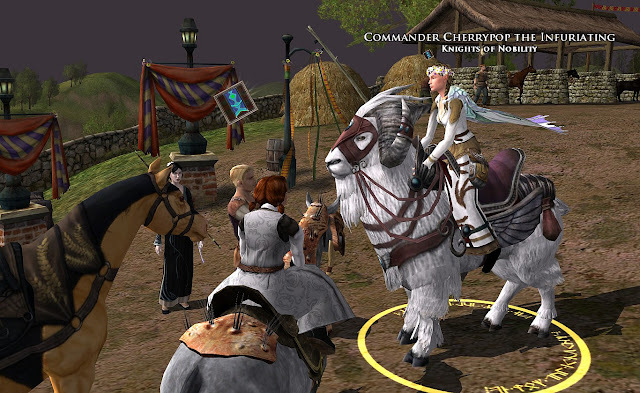 Dalyn met up with Cherrypop, riding the Fleet-footed goat, as both were preparing to get their festival steed. 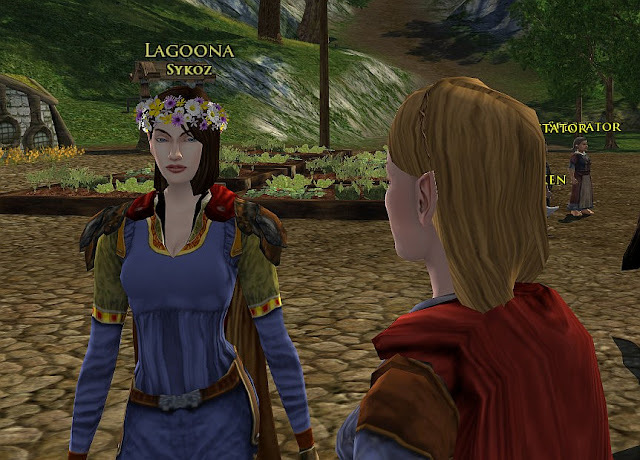 Lagoona sports her newly acquired Circlet of Fresh-Picked Flowers. As so few Golden eggs existed, she set her target on some white eggs and a few festival eggs. Danaboffin voices her opinion about the special request to catch an “Unlikely fish” from a pond that apparently has no Unlikely Fish in it. Before Danaonar left to go back to her role as Thorin’s Hall greeter, Nick Cotton expressed his feelings asking her to stay. Unsure if “carnival life” is for her, she got flustered by his forward gesture. Should she accept this thick footed fellow’s request, or head back to her hammock alone??? Nice wrap up. :) Now, I must know, what top is that that Danadalyn is wearing?? I think I need it! I've always been a festival completionist. This is the first one where I stopped. I was actually trying right up until they made the tickets bound. I stopped right there. I didn't even finish the non-ticketed deeds. They made me *that* fed up. This single festival (and well, experiencing Guild Wars 2 :P) has broken me of my deed completionism I think. A bit sad that. Others have suggested what you have regarding the egg game. I full agree. Set timer, more spawns, NOT TICKETED! (we subscribe for a reason), no collecting extra white eggs once you got your five (like shrew stomp, no stomping more), and you're blocked from collecting coloured eggs that you've already obtained. The fishing quests... just plain bad all around. Solitude sounds so... alone and lonely. The lildanas needed somewhere to go so they got the Angels house. I am making a note to ask tonight what Danadalyn is wearing. I'll reply here when I have the answer. I believe it is a robe, common drop, Dunland area. Mebbe a smarterer cosmetic guru will drop by and give insight before then. (A search on the site for "Danadalyn" shows that she received it before Christmas last year, http://www.danania.net/2012/02/lil-danas.html). Aww, mebbe the Summer festival will be less ridiculous and get us back on deed-er track! Totally understand about the *giving up on Faire* part that you experienced once TicketGate happened. Thankfully for me, I had done everything except Golden Egg and Fishy very fishy by that point. Having never seen a Golden egg drop after more than 300 egg hunts AND confirming so few found on server after 12 days AND TicketGate flattening my ability to spend all day in Sandson's Farm, the Faire broke my will to continue also. Allow me to introduce myself. I am Aegthil of Gondor and my heart beats only for you. For you I promise I will wear my special Rose HawtPants, which I am sure you will find very exciting when we finally meet. Please accept these flowers and chocolates as a token of my undying esteem. P.S. Don't listen to anything Harperella says about me, because it isn't true. She can be so catty. 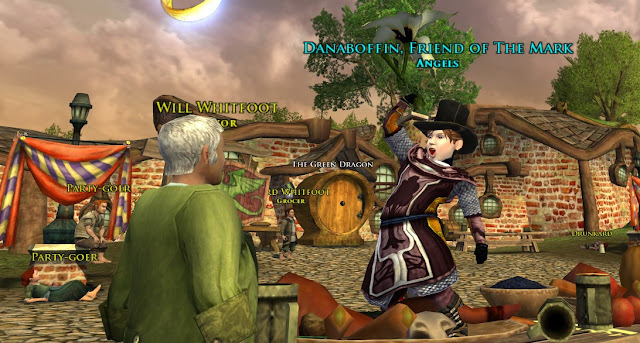 Well hello Aegthil, and welcome to danania.net. I have spies out and have seen the hawtpants... and am enjoying the dizzying image. Thank you. I assume you will stick around, yes? 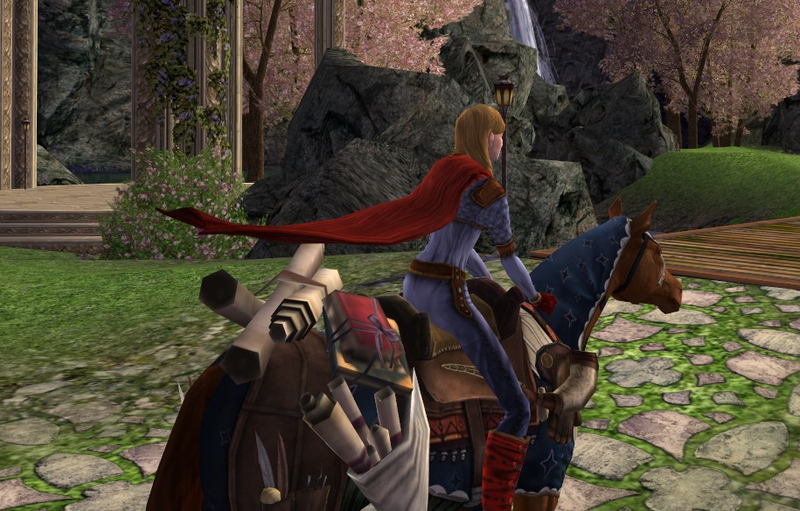 Thanks for the pictures of the Steed of the Lore-master. I needed a final push to buy it and you helped. As always, thanks for the awesome site. Matthew! You are very welcome!